5 pounds of MM Fondant (I am such a novice and not a sculptor, but people like fondant), over almond-bouquet buttercream over dark fudge chocolate cake (2-layer), filled with Oreo/chocolate-chip/milk-chocolate mousse. Created the baby’s bum and chunky legs from Rice Krispie treats because the thought of wrapping cake pieces made me hyperventilate. Averi’s feet were my inspiration. Did it for Jovan, with love, as we anticipate new Baby Rhoades, to-be-born in 2 weeks. Ruth 4. 15 For [my] daughter-in-law, who loves [me] and who is better to [me] than seven sons…. Neither Tredessa nor Averi could resist tickling the feet. The main cake, for size reference, is a 12″ cake, about 4″ high. So the baby is sort of a month or so old maybe, but with big feet? I don’t know…ever-so-slightly life-like in size…? 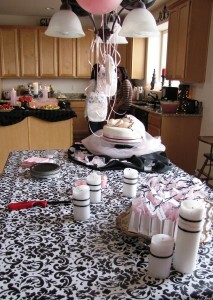 Clicking over to your website, two strong sensations overtook me in seeing the first pictures of your cake. 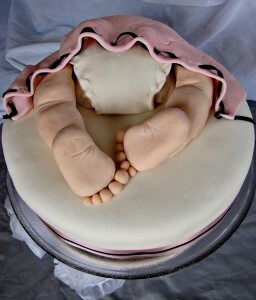 I was startled (having not remembered that I was coming to your blog to re-look at the cake)…where is the other half of the baby?? The second strong sensation (being on day three of NO carbs or sugar of any kind) was…Yuuuuummmmmm! Why the cake startled me, I can not tell you, especially since I took all of those pictures and had to hold it all the way to the Dipernas. ??? Not enough sugar in my system. That MUST be it! OH MY GOODNESS JEANIE!!!!! YOU ARE JUST INCREDIBLE!!!! 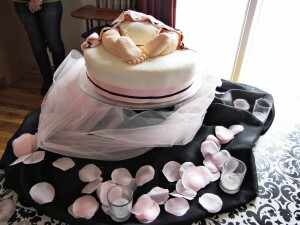 THIS CAKE IS ABSOLUTELY ADORABLE!!!!! ABSOLUTELY!!!! You are so creative. That is a beautiful cake. Awwwww. 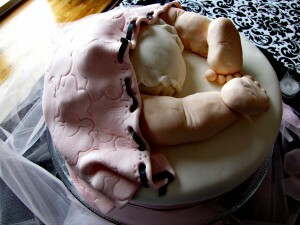 That is the cutest cake ever! 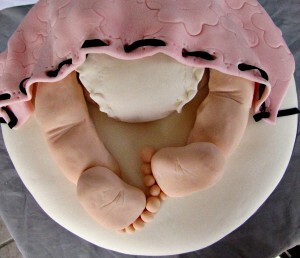 Thank goodness there’s a cake under the baby legs- it would be kind of disturbing to eat. This was your best cake design ever, Jeanie! So, so cute! I love it, I love it, I love it, I love it… I cannot say it enough… I LOVE IT! Ack! How can a person EAT baby bum? Or baby feetses? Even if they ARE rice crispies? ROCKY!?!? Wow, though, Jeanie! So creative… such talent! These cakes were “Precious.! Did you “create those?” Man you could make bucks off of idea’s like that.! I’ll take a slice of left cheek please! I honestly sat there in complete disbelief for a second. I could NOT believe I was actually looking at a cake! But Jeanie, you are so very creative and talented and awesome, there is no reason for disbelief. This cake is amazing, could totally see it on one of those cake shows on TV. Remember us little people when you are famous, okay?